That is what Travis Flood said as he stood in the lobby of Faith Community on December 20, 2017. 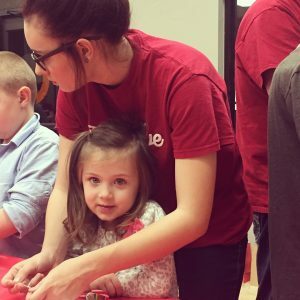 Earlier that night, twenty children, joined by their parents and guardians entered the doors of this church for the first time, welcomed by the people of Faith Community who served dinner, played games, decorated Christmas cookies, and helped them make Christmas ornaments to give as a gifts. It was the biggest Christmas party Faith Community had ever thrown. But that wasn’t in the original plan at all. 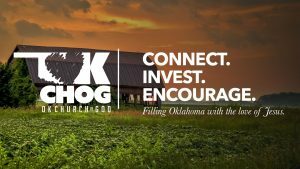 Back in the summer of 2017, after the usual flurry of activity surrounding summer camps, VBS, baby dedications, and back to school plans, the staff of Faith Community began planning for Christmas. A number of the congregation had participated in the previous year’s annual Shawnee Christmas Parade. Staff and volunteers agreed, returning to that event was important. But God’s plans were much bigger. 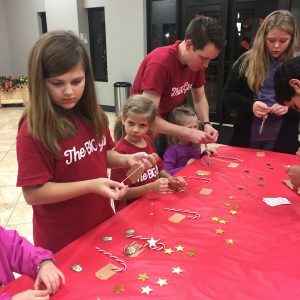 The children’s ministry, Faith Kids, follows Orange curriculum, and the Christmas series and accompanying program for 2017 was titled “The Big Give.” The series was about generosity, with a central theme of “Making someone’s day by giving something away.” Pastor James Eustace liked the theme, and committed himself to adapting the children’s lessons into sermons geared toward adults. “If we’re going to inspire our people to be generous, we as a church need to be generous,” Eustace said. From top to bottom, every part of the church had to be aligned in order to make it a success. A team of staff and volunteer leaders came together to brainstorm how to make The Big Give happen. The church would participate in Shawnee’s Christmas parade, Pastor James would center the messages around The Big Give, and Children’s Pastor Mandi Wells would orchestrate The Big Give family experience, an interactive church service for all ages with skits, music, crowd participation games, and a special telling of the Christmas story centered around generosity. And on December 17, the date of The Big Give family experience, the entire offering would be given away. Faith Kids teachers distributed small wooden banks to their classes, so that even the youngest at Faith Community would have the opportunity to participate in the offering. It was in October that Eustace preached a series called For Our Neighbors, inspired in part by his experience at the Orange Conference. Near the end of the series, Travis Flood and Brandon Dyer from Community Renewal of Pottawatomie County were invited as guest speakers to help inspire and motivate [those in attendance] to take time to get to know their neighbors by joining the We Care team, a group of families and individuals spanning all of Pottawatomie County who are simply committed to loving their neighbors. 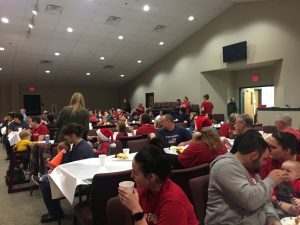 At Flood’s urging, Lori Stacy, chair of the church council, began organizing a Christmas party to take place after the family experience, where families identified by Flood would participate in activities alongside Faith Community families, and receive gifts purchased with the Big Give offering. Flood collected the children’s wish lists from their parents and guardians. Volunteers were mobilized to provide food, crafts, and set up for the party. The local Gideons chapter provided family bibles and life books to be given to each family. Youth volunteer Mylee Wells, along with youth minister Shelby Beal, oversaw parade preparations, and organized a team of float builders and parade walkers. The team prepared 2,000 goodie bags filled with candy to give away along the parade route. Each bag also contained an invitation to The Big Give Family Experience. More than 20 adults and kids endured frigid temperatures to spend time in the community handing out goodie bags and welcoming Shawnee to Faith Community. 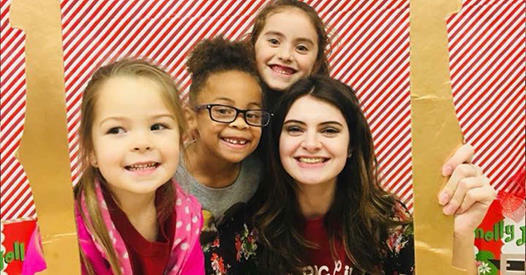 On December 17, youth volunteers performed in the Family Experience, children danced and sang, and adults and children alike were generous and gave big. Faith Community received over $6,000 in the offering, which allowed Community Groups to spend $200 on gifts for each of 19 children, and give generous grocery gift cards to 13 families. Immediately following the family experience, the offering was counted and divided among Community Groups, the members of which spent two days buying and wrapping gifts on the provided wish lists. Items purchased included new shoes, coats, toys, bicycles, and books. On the night of the party, families were welcomed into the Faith Community auditorium to enjoy a meal provided by Chick-fil-A, with homemade desserts. A creative video of the Christmas story was shown, and then the party of over 100 people separated into smaller groups. Children made Christmas ornaments and decorated cookies with their guardians, and then the visiting families were taken into private rooms to receive their gifts.